KUALA KANGSAR: It is the responsibility of every Muslim to portray Islam as a moderate religion. 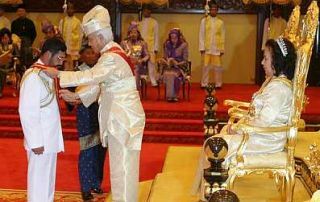 Peraks Sultan Azlan Shah called for a collective effort to promote Islam as respectful of other religions and cultures at an investiture ceremony at Istana Iskandariah here yesterday. DAY TO REMEMBER: Ling’s wife Carol Ong Lee Choo taking a closer look at his award after the ceremony. He said through their speech and actions Muslims would determine how others viewed Islam. Muslims should understand the realities of living in a multiracial country where its people come from different religious and cultural backgrounds, he said. Avoid being too rigid in your interpretation of issues affecting those from other religions, as it could lead to unrest in our country. A total of 61 people, led by navy chief Admiral Datuk Ilyas Din, were bestowed state awards during the ceremony, held in conjunction with the Sultans 78th birthday. Among the 44 recipients of the Darjah Datuk Paduka Mahkota Perak (DPMP) which carries the title of Datuk are MCA Youth deputy chief Ling Hee Leong, Bukit Gantang MP Tan Lian Hoe and Pasir Panjang assemblyman M. Ramachandran. Earlier, in his speech, the Raja Muda of Perak Raja Nazrin Shah urged Islamic leaders to take an active stand in providing an accurate picture of Islam to the West to support world peace efforts. SPECIAL HONOUR: Sultan Azlan Shah bestowing the Darjah Datuk Seri Panglima Taming Sari (SPTS)which carries the title ‘Datuk Seri’ on Ilyas at Istana Iskandariah in Kuala Kangsar yesterday. 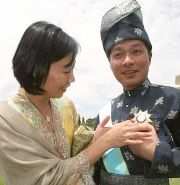 Looking on is Raja Permaisuri Perak Tuanku Bainun. He said the tension between the West, especially the US, and Islamic countries and communities was a major challenge. There are too many conflicts between the two, with each leaning towards war in an effort to attain peace, he said. Raja Nazrin further pledged to participate at world forums and discussions to help in building bridges of understanding between Islam and the West. He also urged members of the royal family to practise discipline to preserve the integrity of the royal institution. Any wrongdoing, be it in speech or action, will open the floodgates of criticism on the institution, which will also affect the people in the long run, he said.